Visiting the Kutna Hora Bone Church and other sites in Kutna Hora is undoubtedly one of the more interesting day trips you can take from Prague. 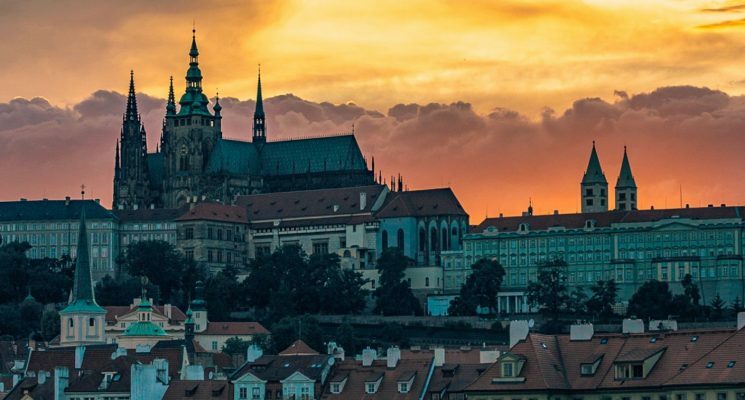 The Czech Republic is home to some of the most magnificent castles, delicious beer and beautiful nature in the world. 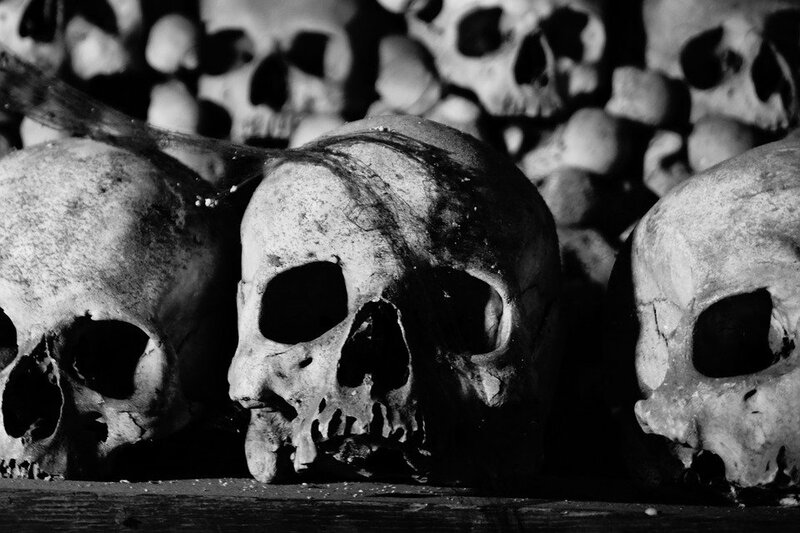 It is also home to Sedlec Ossuary, which houses the decorated remains of more than 40,000 people. Think we’re kidding? We’re not. Only one hour outside of Prague, Sedlec Ossuary (Kostnice), or as its better-known, the Kutna Hora Bone Church, is one of the country’s most unusual and well-known tourist attractions. Each year, thousands of curious tourists pass through the small Czech village of Sedlec to see the bizarre arrangements of human remains with their own eyes. It isn’t as creepy as it sounds, promise. A day trip from Prague to Sedlec Ossuary can easily be combined with several UNESCO World Heritage Sites and the medieval mining town of Kutna Hora. Kutná Hora, or the city of silver, was once the seat of national treasury and was responsible for much of the wealth and power throughout the Czech Kingdom. Much like the Bone Church, Kutná Hora is filled to the brim with remnants of the past including the late gothic Church of St. Barbara and the 13th-century Italian Court palace. If you’re visiting Prague, Kutná Hora is an easy, affordable and memorable day trip from the busy Czech capital. First things first, let’s help you get there. 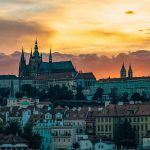 When planning your day trip from Prague to Kutna Hora, it is important to decide whether you’d like to start in the center of Kutna Hora or the village of Sedlec, home to the Kutna Hora Bone Church, or Sedlec Ossuary (kostnice sedlec) . Trains to Kutna Hora leave Prague Main Station (Praha hl.n.) every two hours and total travel time is about one hour. First, you will arrive at Kutna Hora Main Station (Kutná Hora hl.n. ), which is about one kilometer from the center of Sedelec and four kilometers from the city of Kutna Hora. If you’re visiting Sedlec first, you can opt for a 15-minute walk or take the local train one stop to Kutna Hora-Sedlec. Kutná Hora-Sedlec is a request stop, so be sure to press the request-stop button (zastávka na znamení) located near the train door. If you miss the train, take one of the Kutná Hora city buses (No. 1 and 7) and get off at the second stop, Sedlec Tabak. If the town of Kutna Hora is your first stop, transfer to the local train at Kutná Hora Main Station and get off at Kutna Hora Mesto. In this case, make sure you purchase a return ticket in Prague for Kutna Hora Mesto, not Kutná Hora Main Station. This way you will only pay one fee. Again, if you miss the train, you can take city bus (No. 1) into town. You can purchase tickets at the train station or online here. The price is approximately 112 Kč return. For a small fee, you can easily get from one attraction to another by a private eight-passenger tourist bus (minivan). The tourist bus runs between Kutná Hora Main Station, Sedlec Ossuary and Church of St. Barbara in town. It departs after a minimum of three people are on board. For €30.00 you can take a small tour that includes private bus transportation from Prague to Kutna Hora. The tour includes a guide, entrance to St. Barbara’s Church, and the Sedlec Ossuary bone chapel. Additionally you will discover the Italian court, Hradek Castle, and Bohemia’s oldest Cistercian Monastery. Buses from Prague to Kutná Hora leave every hour from Praha-Haje bus stop (Metro C, Red Line). The journey takes about one hour and forty minutes. The advantage to taking the bus is that it drops you off directly in the Kutná Hora city center. A slightly faster bus leaves from Florence bus terminal (ÚAN Florenc Praha) to Kutná Hora every morning. Buses return to Prague from the same location. Going by car from Prague to Kutná Hora takes approximately one hour. You can also travel by taxi or Uber. Thinking about turning your day trip into an overnighter? We don’t blame you. Kutná Hora is full of budget-friendly hotels and pensions perfect for a short stay. 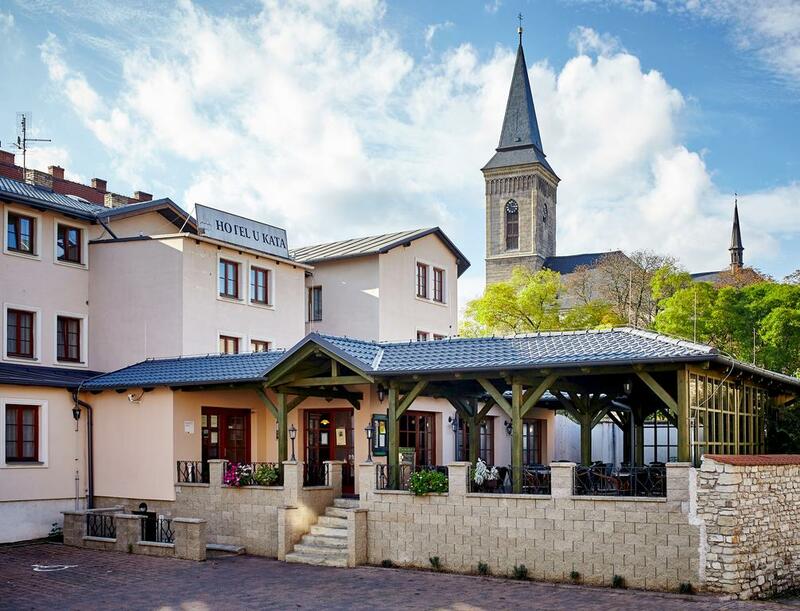 You may want to check out Hotel U Kata, which is located only 200 meters from Kutná Hora’s historic center and the main train station. U Kata is cozy and affordable option complete with its own wellness center, including Guests can enjoy the sauna and a massage along with their very own beer bath. U Kata also has a large rustic-style restaurant which serves a mix of traditional Czech and international dishes. Click here for the best rates! If you’re looking for something a bit more luxurious, it might be worth spending a romantic evening at Chateau Třebešice. The historic, Renaissance era chateau is located in the sleepy village of Třebešice, about five kilometers from Kutná Hora. Each suite is uniquely decorated and guests can enjoy a wide range of art, design and the lush chateau gardens. Click here for the best rates! For a hearty, satisfying Czech meal, try Dacicky restaurant. 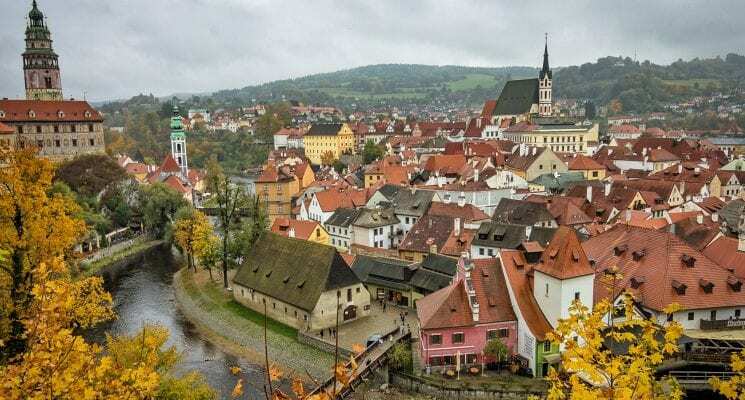 Known for their wild boar goulash with gingerbread dumpling, the traditional Czech pub is the perfect place to grab a pint and fill up after a long day of sightseeing. That being said, Czech food is notoriously heavy. If you’re looking for something a bit lighter, stop by Bistro Barborska for a quick lunch and coffee. In case you’ve ever wondered what a chandelier or pyramid of human bones looks like, you’ve come to the right place. Sedlec Ossuary, or the Kutná Hora Bone Church, is a small Roman Catholic chapel located beneath the Cemetery Church of All Saints. As part of the 12th-century Sedlec Abbey, the cemetery was once a popular burial ground for aristocracy of Central Europe. During the thirty years’ war, the number of new deaths exceeded the burial spaces available. As a result, older remains were exhumed and moved to the chapel. As legend goes, half-blind, half-mad monks were assigned to care for the chapel and got busy rearranging the bones in geometric shapes. In the late 1800’s, a woodcarver was commissioned to redecorate the chapel with the bones as a morbid reminder of human mortality and the inescapability of death. Good family fun, right? Nowadays, an estimated 40,000-70,000 ancient skulls and bones ornament the walls and ceilings of the Kutna Hora bone church. Most notable is the massive chandelier in the lower level of the chapel, as well as a skull candelabra and coats of arms. Overall, it is a pretty fascinating place and much more aesthetically “beautiful” than dark or depressing. The Kutna Hora Bone Church (Sedlec Ossuary) is open seven days a week all year round. Visitors can purchase a single entry for 50 Kč, or a multi-admission ticket including entry to the Kutna Hora Bone Church, the Cemetery Church of All Saints, and the Cathedral of Our Lady in Sedlec for 220 Kč. 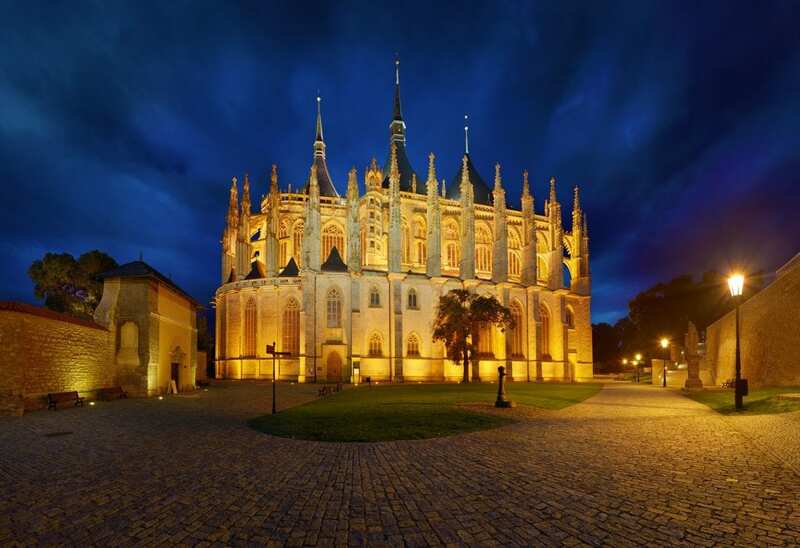 Only a short stroll from the Kutna Hora Bone Church is the UNESCO-protected Cathedral of Our Lady in Sedlec. Formerly part of the Cistercian monastery, the enormous High Gothic cathedral was once the most prominent church in the Kingdom of Bohemia. In 1421, the church was burnt down by the Hussites and lay in ruins until its reconstruction during the early 18th century. Though heavily influenced by contemporary Baroque architecture, aspects the original, Gothic appearance were preserved. As a result, Cathedral of Our Lady in Sedlec is one of Europe’s oldest and rarest examples of the Gothic Baroque style and must-see for architecture-buffs! Visitors can also enjoy the cathedral’s stunning interior, celestial murals and climb upstairs to observe the construction of the roof and domed ceilings. As if one impressive cathedral wasn’t enough, Kutná Hora is also home to the Roman Catholic Church of St Barbara. Located in the heart of Kutná Hora’s historic center, it is easily one of the town’s most significant and recognizable landmarks. Its origins date back to the year 1388, and it took over 500 years to complete. During that time, it served as a place of worship for the local silver miners and their families. Its standout features include a stunning three-tent roof, eight chapels and detailed flying buttresses. For 60 Kč, guests can enter the church and tour its intricate interior while checking out a collection of Renaissance frescoes and some seriously breathtaking stained glass windows. The Italian Court played a vital role in the history and of Kutna Hora and the towns economic influence and power for several hundred years. The 13th-century palace was once the Central Mint of Prague and residence of the king when he came to town. It also served as a storehouse for the silver ore mined which was from the surrounding region. Today, the Italian Court functions as a museum and Kutna Hora’s town hall. Visitors can enjoy guided tours of the large courtyard where the original coin-makers worked, and the minting chamber where the silver Prague groschen coins were struck during the reign of the Bohemian King, Wenceslaus II. The Czech Museum of Silver is one of the Czech Republic’s oldest and richest museums. Founded in 1877 in Hrádek, or little castle, it houses over 185,000 authentic items pertaining to Kutná Hora’s long history of silver mining and minting. Guests can choose between two guided tours. 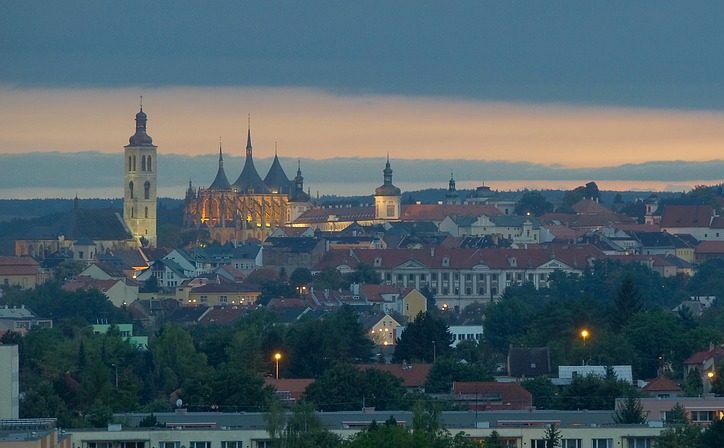 The Silver City Tour traces the history of Kutná Hora and its rise to economic power as a royal mining town. The Journey of Silver Tour takes a closer look at original silver extraction equipment and the lives of the miners. The Museum is closed on Mondays. Finished during the mid-18th century, the Jesuit College contains a large art gallery and large terrace with 13 statues of saints. It is located next to the Church of St. Barbara. The Gothic Stone Fountain is a twelve-sided fountain built in 1493. Throughout history, it was used as the towns main water source. It can be found in the center of Rejsek Square. Construction of the Church of Saint James began in 1330. Its large, gothic tower is a symbol of the Kutna Hora skyline. Closely linked to the Church of St. Barbara, its bottom floor was once used bottom floor was used for the storage of bones. It has one of the few completely preserved High Gothic interiors in the Czech Republic. The Baroque statue was built in 1715. It is memorial to the victims who died during a terrible Plague in 1713. The column is decorated with mining motifs and a statue of the Immaculate Virgin Mary. So there you have it folks, yet another amazing day trip you can take from Prague. As you can see Kutna Hora is really worth visiting, and its super easy to get to, so go check it out while you are in Prague! As always happy travels, and we’ll see you on the road! Disclaimer – We have included a few handy little affiliate links in case any of our readers want to book accommodations, car rental, or a tour. We receive a small commission for any sales made, without any additional cost to you, our dear reader.